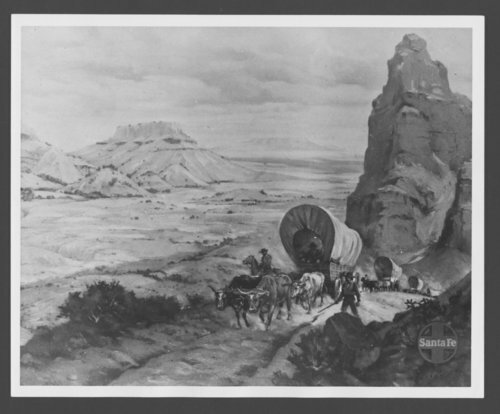 This photograph, from a painting by Max E.H. Gundlach, shows a caravan of covered wagons traveling along the Santa Fe Trail. This trail opened as a commerce and military highway in 1821 when William Becknell lead the first expedition from Franklin, Missouri to Santa Fe, New Mexico. The route crosses through Missouri, Kansas, Oklahoma, Colorado and New Mexico. This painting appeared on the 1946 Atchison, Topeka & Santa Fe Railway Company calendar.